The line of cars stretched along the forest lane. Forestry Commission lane that is. GGers in various stages of stripped off mode were generously scattered alongside half buried in heather and gorse. Desultory chat and bursts of laughter broke the silence. It was a pleasant sylvan scene. It is Burnt Platt. So there I am looking across the lane at the newly ‘scrubbed’ piece of heather purged of all alien growth, pristine and splendid and looking at my bit. It has bramble crawling all over as if ashamed of the heather beneath and desperately trying to cover it up. It has wisps of conifer poking through. That ubiquitous woodland weed, birch, springs through everything else. We have to snip, lop, uproot, shear, saw, pull or yank even, all that is not heather must come out or off. Beyond me and behind me the growth gets bigger and longer. I could be here for weeks, me versus Nature. It is a Sisyphean task. Let me explain. 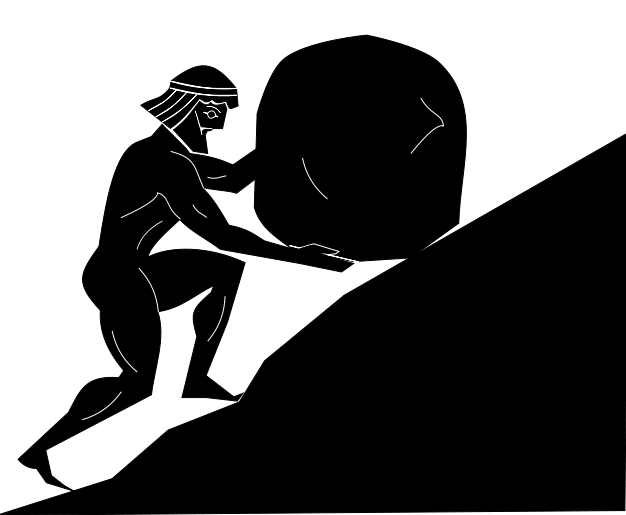 In Greek mythology, Sisyphus was a king of Ephyra (now known as Corinth). He was punished for his deceitfulness by being compelled by Zeus, the father of the gods, to roll an immense boulder up a hill only to watch it roll down again, repeating the action forever. There is a lot more to the story but space and your attention span (ie my one reader plus Ed.) forbids. I muse on similar stories and our GG tasks and sites. It is a matter of Life Force that once we have completed a task a year later we may be called on to do it again. So scrub bashing at Aston Rowant is a Colossal task (the Colossus of Rhodes was a statue of the Greek god of the sun, Helios, standing over 98 feet above the harbour and one of the 7 Wonders of the Ancient World). Ragwort pulling at Gillott’s is a Herculean task (Hercules, the son of Zeus, was tasked with cleaning out the Augean stables which held 1000 cattle and had not been cleared out for 30 years—-eeeeeek! ( How he did it is another story). I am now working on other connections of GG tasks and mythological giants, Titanic (race of giants who attempted to reach heaven by piling Mount Helion on top of Mount Ossa) (pounding in wooden posts for many a kissing gate), Cyclopean walls (huge boulders making great walls and the one eyed giants) (huge piles of greenery on the bund at Ewelme, heavy enough to bend a fork). The list goes on……….what about Gigantic, Ginormous and Humongous!